It can also use built-in applications such as a call centre solution, mobile solution and voice mail system to provide more efficient work and increased customer satisfaction. As a standard feature, the KX-NS500 can connect customers to the appropriate section or operator according to their query in call routing with voice guidance. It can also prompt the customers to leave a voice message when the operator is away. 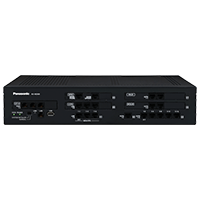 The KX-NS500 can be expanded to a voice mail system that can record a maximum of 24 channels at the same time and store up to 400 hours. It also sends an e-mail to notify users when they have new voice messages. The messages can also be received as attachment files and forwarded. E-mail notification can also be sent for missed calls where the customer did not leave a message, enabling users to quickly contact the customer. To deliver outstanding customer service in the hospitality sector, your staff need the support of effective and always-available communications technology. The KX-NS500 offers both. Comprehensive system management, PC integration and the flexibility to provide mobile communications throughout your business mean you’re able to work more efficiently than ever before and your customers enjoy the most convenient, comfortable experience possible. In healthcare environments, consistent, clear communications are critical. The KX-NS500 is a solution that allows your staff to access easy-to-use technology and remain in constant contact with other team members and patients or residents, wherever they are. Equally valuable is its ability to integrate with your existing care applications, such as emergency call systems. Perfect for supporting office functions across your business, the KX-NS500 incorporates mobile telephony, desk-based phones and highly configurable voicemail systems to ensure that staff stay connected, wherever they’re working. Combined, they improve functionality, reduce costs, simplify administration and enhance customer service. External battery port is supported.